Motorola's G5S and G5S Plus smartphones due this month | What Hi-Fi? The Android smartphones are a marked improvement over the standard Moto G5 on paper, with a better battery life and a more sophisticated camera. Were the Moto G5 and G5 Plus not special enough for you? Well, then your prayers have been answered with the Moto G5S and Moto G5S Plus (the S, presumably, standing for 'special'). You know what else begins with 'S'? Specs! 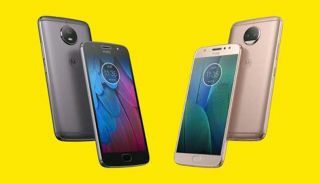 So let's get into them: the Moto G5S and G5S Plus have a 3000 mAh all-day battery (200 mAh more than the standard G5), with quick charging so you can get a five hour battery life in just 15 minutes (according to Moto, that is). If you're thinking about taking a lot of snaps, the G5S has a 16-megapixel camera on its back (3 megapixels more than its predecessor) with phase detection autofocus (PDAF) for faster focusing, while the G5S Plus has dual 13MP rear cameras for a bokeh background. Selfies more your game? Then there's an eight-megapixel wide-angle front camera on the G5S Plus, or a five-megapixel camera on the G5S. Processing power for the G5S comes from a 1.4GHz octa-core processor, while its bigger sibling has a 2.0 GHz octa-core processor. Both have a Full HD screen, on a 5.2in display for the G5S and a 5.5in display for the larger model. Price-wise, the Moto G5S and Moto G5s Plus will be available from early August, starting at £220 for the Moto G5S and £260 for the Moto G5S Plus. Of course, we'd always recommend waiting for the review before snapping one up.